Recently, we replaced a vehicle that did have a built-in DVD player with one that doesn’t. At first, my kids were not getting along near as much in our new car as our old one. They lacked the entertainment they’d grown used to and as a result, they had been causing a lot more disruptions. I was about to purchase an in-car DVD player for our new vehicle to help keep my little children entertained. After some contemplation and brainstorming of what to do, I remembered what my aunt and uncle did to entertain their kids in the car and thought I’d try the same. Growing up, my aunt and uncle often read aloud to their kids while they drove in the car. Usually my aunt drove and my uncle read. I remember when I drove with them that I thought it was neat to hear stories from different books. So, the thought occurred to me to try playing audiobooks for my kids instead of movies. It started out as just an experiment, now it’s become a way of life. I hoped it would go well because I like to limit screen-time. First, I downloaded my local library’s audio book App. 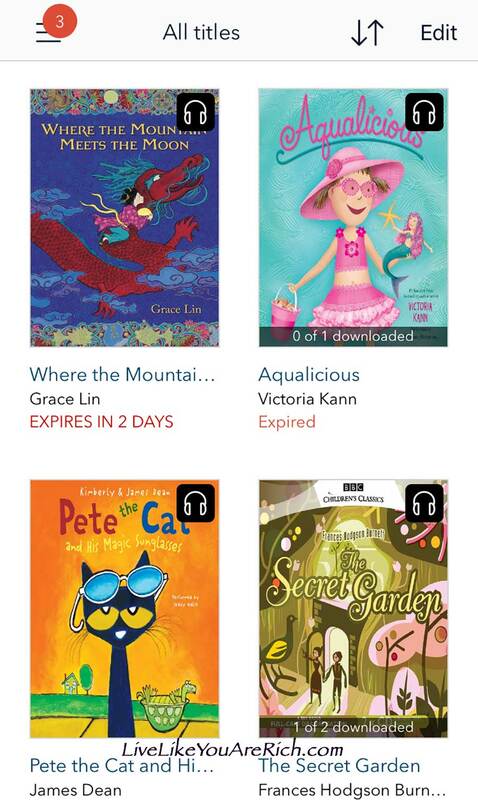 Next, I went into my account and checked out audiobooks that I knew and thought my kids would like to read. I got on wait lists if the audiobook wasn’t immediately available. I also have an Audible account through Amazon. This month, I was able to download a free kids audiobook that has great reviews. My husband and I like to listen to audio books as we drive, clean, work, etc. with or without the kids as well. Often we save our Audible credits for our books but on occasion we splurge for a kids book we all love. 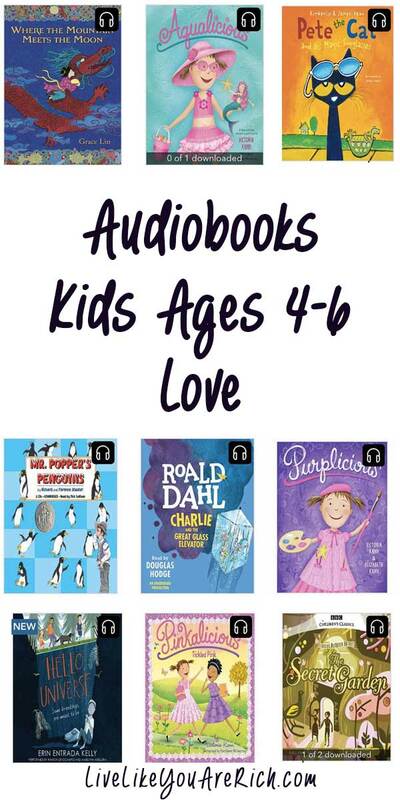 My kids have really enjoyed listening to audiobooks in the car! The fighting and/or annoying one another dramatically decreased. Now, we often laugh, cringe, gasp, etc. to the same things during the audiobook at the same time. Talking about the books and theorizing has been a fun for our family as well. Listening to audiobooks as a family has been a fun bonding experience. So far, hours of entertainment in the car for the kids and I has come free via my local library’s audiobook store and free downloads via Audible. I have noticed a lot of benefits in my children the last four months as well as in myself. I don’t dread the long drives or running errands near as much anymore as well! Here are a few benefits that I’ve noticed in my kids as well as what studies have shown audiobooks do for kids. Benefits of audiobooks for little children. My son’s reading has dramatically improved since starting to listen to audiobooks. Audiobooks provide an educational source of entertainment while reducing screen time. Children use their imaginations and are forced to create characters and scenes in their minds that picture books and screen time do not foster. Listening to audiobooks with little children really is worth an experiment! I’d highly recommend you try it. I was pleasantly surprised how well the results of our experiment were. Now, it is no longer an experiment, it has become a way of life. I hope you get the chance to enjoy audiobooks with your kids as well! 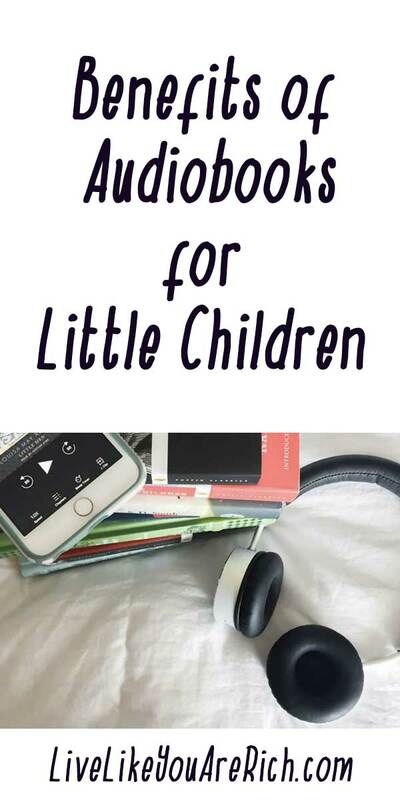 Check out my list of our family’s favorite audiobooks here.